I'm 59 years old, an identical twin, mother of DD31 and DS30. 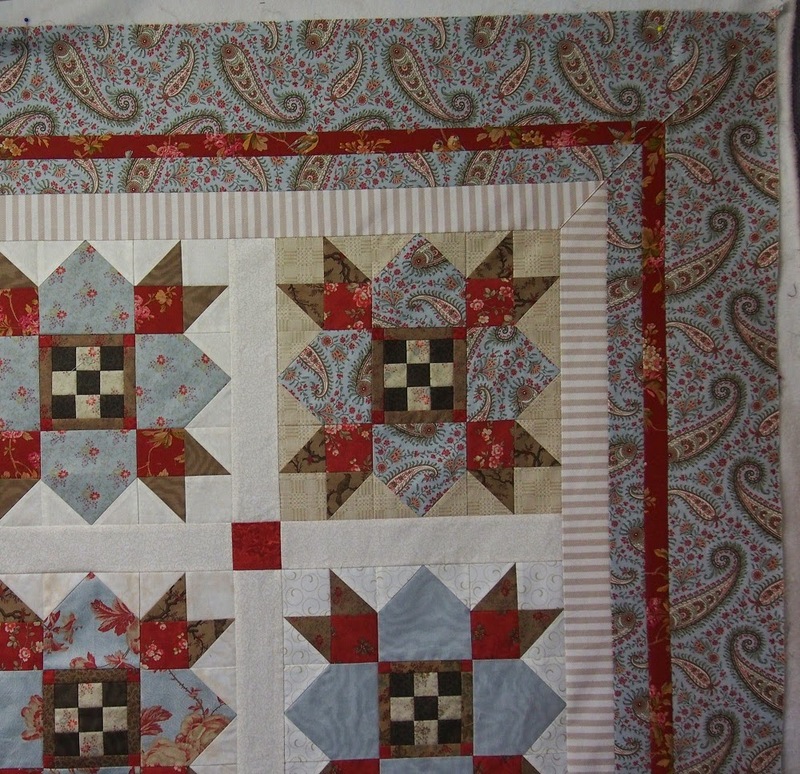 I live in country South Australia and run my own quilting and pattern business with my sister. I still haven't been able to do any sewing; the lack of it is bad for my mental health. 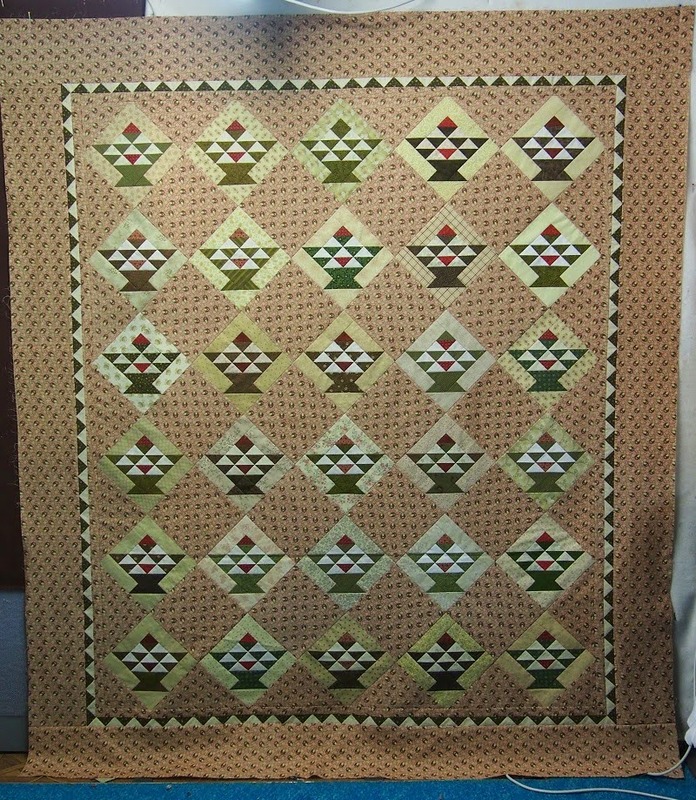 I might get grumpy if I don't get the borders on that quilt soon! 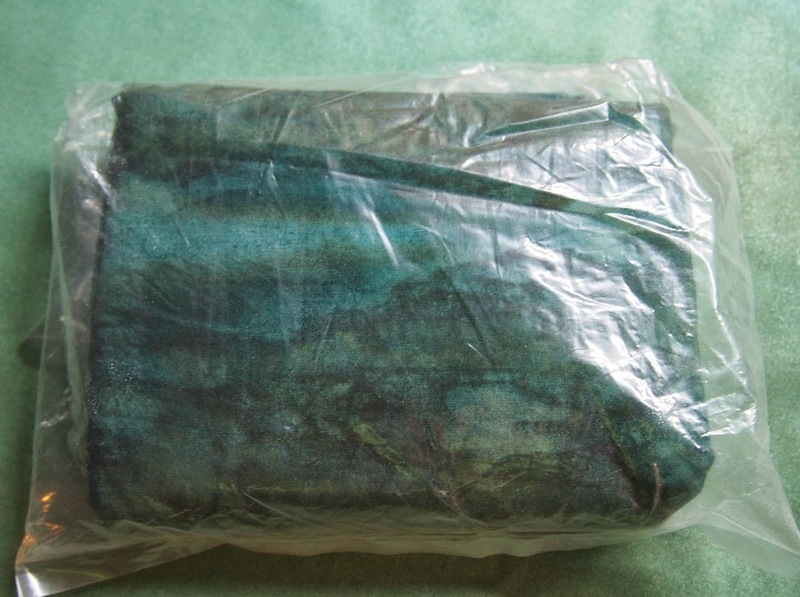 This is the piece of fabric I want to use as borders, damped down and wrapped in a bag ready to iron. It's been waiting 36 hours for me to get to it, if I don't hurry up it will either be dry or mouldy. 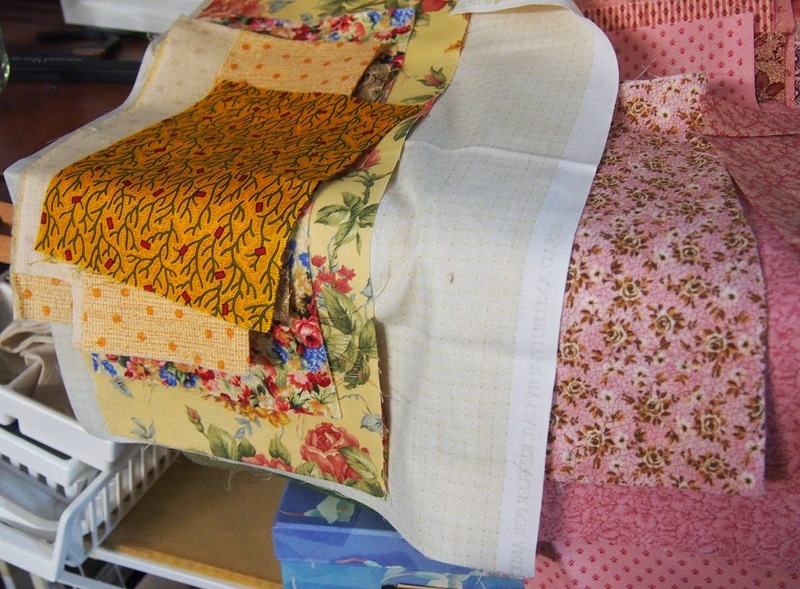 Let's not mention the fabric waiting to be put away, and scraps needing to be sorted. My room is in upheaval. I just can't find the time to do it all. I've been quilting in every available spare moment, a rush order for one of our favourite customers; she needs a quilt as a gift for a friend, and her trip to Sydney won't take place until the quilt is finished. 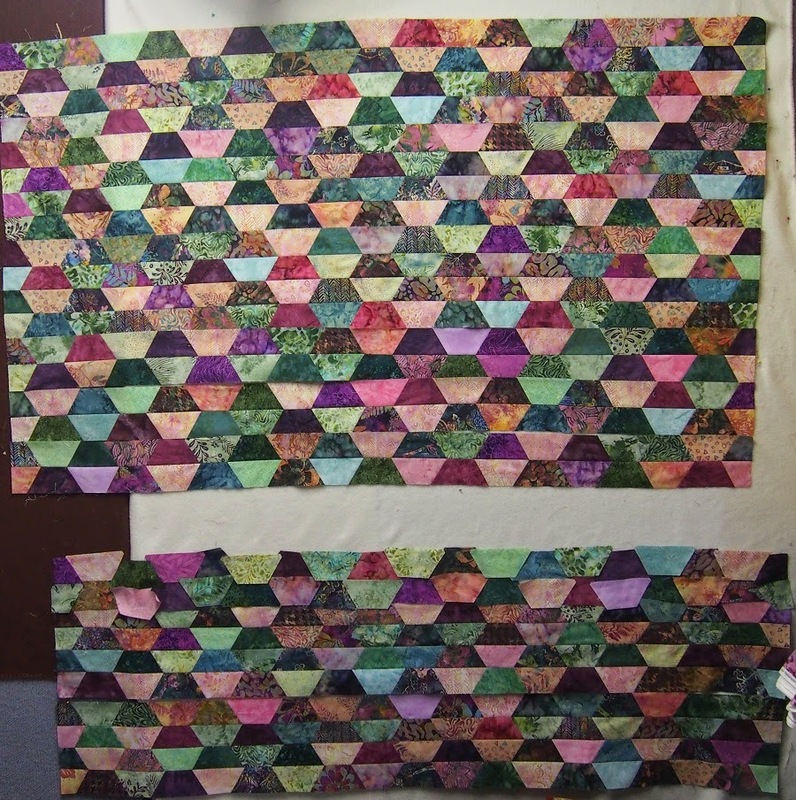 So I've been working on it, and two small quilts, for the last few days. We bind her quilts as well, so it's not just a simple quilting job, and I had another binding job to do on a big quilt; I've been in the workroom under a mountain of quilt, and it's a good thing the AC is working well. It will have a hissy fit when the temperature gets into the 40s, but for now it's doing it's job. Dolly has been lying in a comfy chair the whole time, keeping an eye on me as I work, and asking to go for walks, but there was no time for that. 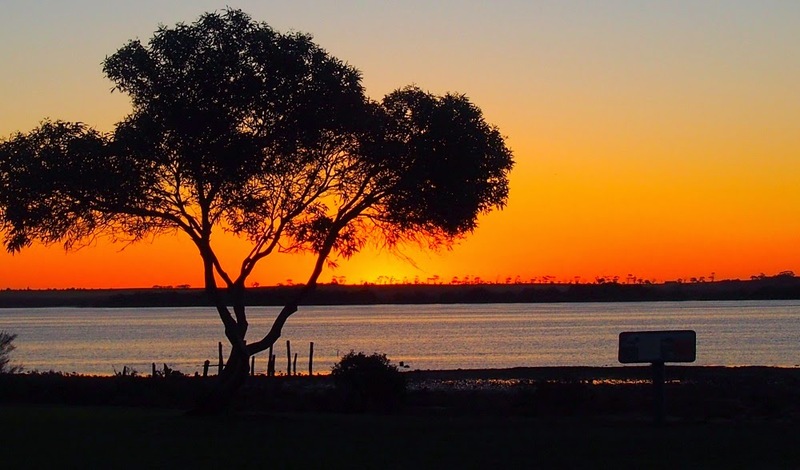 Last night I'd had enough, and we went to Port Broughton for some R&R. 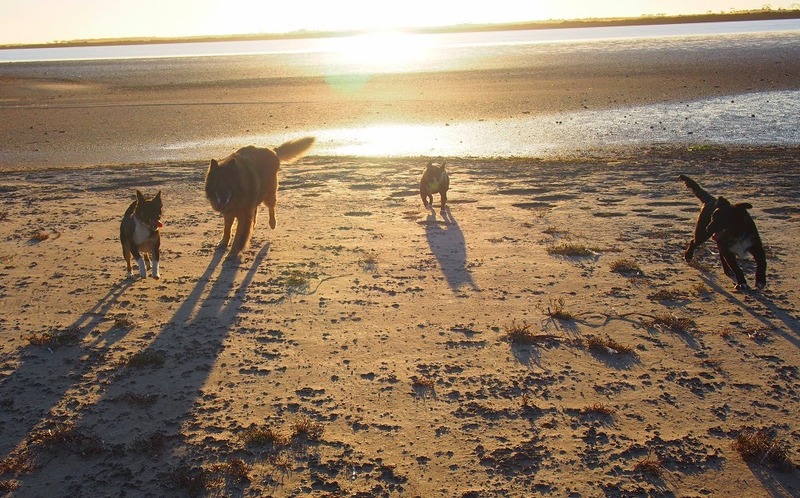 It was a lovely evening, with the tide in, and both dogs got wet and had a wonderful time. We were content to walk along the beach and enjoy the peace and tangy salt-sea air. It was just what I needed to wind down after a work day. 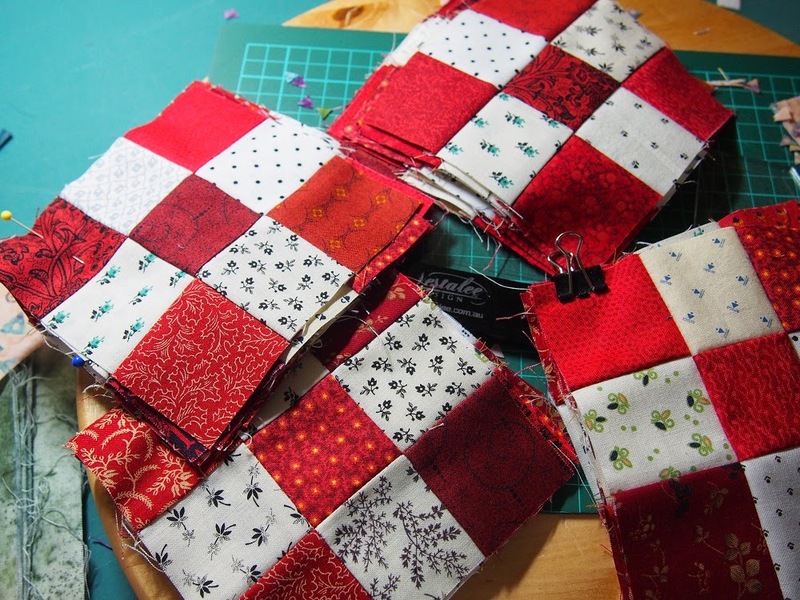 Today I need to finish the bindings on the small quilts, pick up Pippi so I can have her while Mereth goes to Adelaide for a grandson's 4th birthday (4 already!! ), get everything assembled for DB so he can finish the screen door installation, then go round his place for tea. He'll be here early to get to work, so I'd better get a good night's sleep. That's my day mapped out. My Sunday was hijacked; first by my brother doing some work on my doorway, so a new screen door can be installed, and then by a monster garage sale. The garage sale was more fun; when my DB comes round it's like stirring up an ant nest with a stick. A peaceful morning degenerates into chaos, as bits are ripped off the door stiles, paint scraped off bricks and there are multiple requests from the worker like 'Have you got any steel wool? What about mortar? Is that all? How old is it? Where's the hose? I need a clean bucket!' And I just scurry around trying to keep up with all the demands. The plus side is that things get done quickly, and properly, and he accepts payment in scones. It's just that I'm exhausted after an hour or two, and he bustles off home to really get stuck into some work. The garage sale was excellent, at a place we have always eyed off with longing. He had sheds full of everything imaginable, the sheer amount was mind-boggling; this is the second time his family have sorted out the sheds and had a sale. By the time we arrived, at midday, all the really good stuff was gone, but we managed to get 4 trailer loads of stuff anyway. 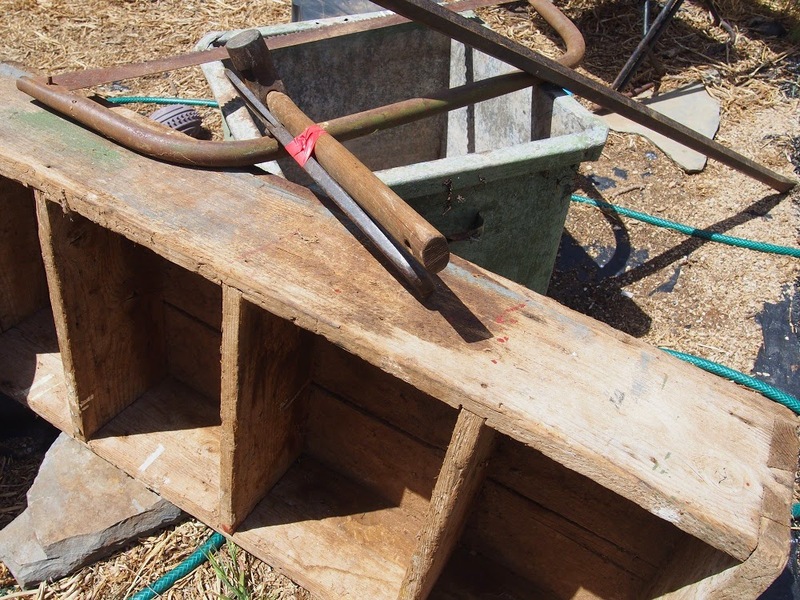 We grabbed huge piles of things that we knew we could use in the garden; trellis and gates and wood and old wheelbarrows, loads of miscellaneous metal and PVC pipe, metal planters and drums, great old tools that were really good quality, rolls of wire fencing, bedsteads and boxes. I even got a crowbar, which I've wanted for ages, for $1!! I'm so easily pleased. It's not too big, but very sturdy; is there such a thing as a Lady's Crowbar? If so, I've got one. Some people see junk, we see possibilities. At the end of the day the guys were loading all sorts into our trailer, and when we protested they said "It's all free now, you can have it anyway" so it was even more of a bargain. Even though I was filthy dirty after digging through all that rubbish I much prefer that sort of a sale; it was so interesting to see what he had. I bet that for years when his family wanted something repaired he could say "I've got just what you need in the shed". October is always a busy month for our family, with three birthdays to celebrate, but this year there were friends visiting and family staying, and extra work hours at the Post Office, so the last few weeks have just gone by in a blur. Dolly enjoyed spending time with our friends Kathy and Paul, who came for coffee one morning. They are touring here in SA, on a visit from Western Australia. They treated her the way she thinks she ought to be treated, non-stop attention and cuddles. What a life.What a spoilt puppy. We've also had our first 39° day for the season, and there's plenty more to come; the heat is so disgusting, there's not much you can do except sit in front of a fan and wait for evening. The dogs are pathetic, panting nonstop and laying like frogs on any cool floor they can find. Welcome to another summer. I haven't sewn a single stitch in the last week, which makes me grumpy and frazzled. 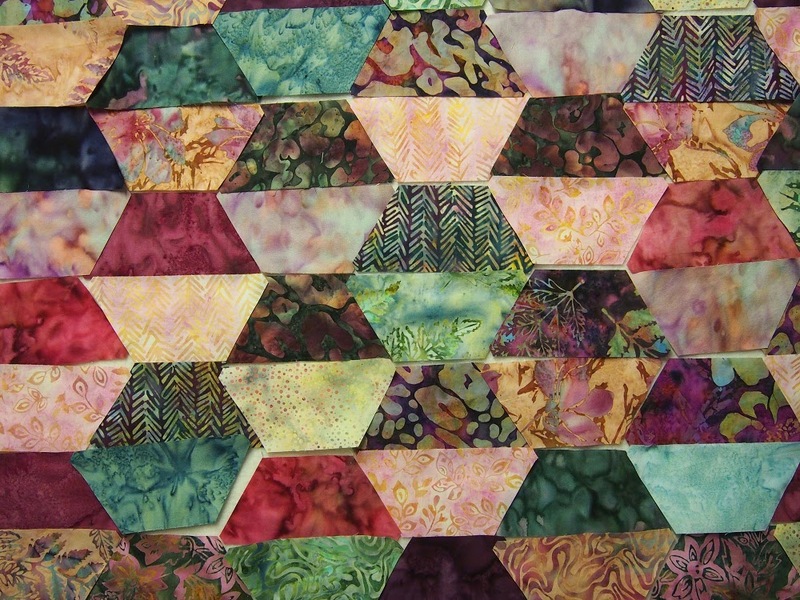 It's Saturday today, and after my garden duties I am going to get my batik half-hexagons in one piece. I'm sick of the sight of them on the design wall, they were meant to be a quickie project and they're lingering way past their time. The gap in the middle is caused by the two rows on my machine, abandoned when work commitments took over. 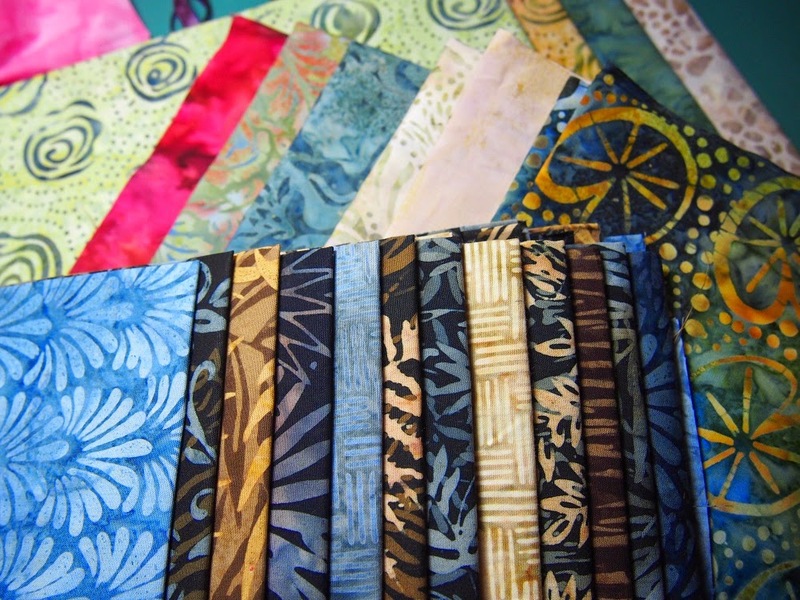 I maayy have bought a heap of batiks online, but it was a birthday present to myself, and in the process of making my first batik quilt the inadequacy of my stash became apparent very quickly. So I'd better start collecting them more seriously, if I ever want to be able to make something without tearing my hair out. The effect of this purchase (13 metres) on my Stash numbers was dramatic, it added more than 10% in one go! This year I have bought 120.4 metres, used 156.15 metres, for a net total of 35.75 metres used. I'm pretty sure I've accounted for all the purchases, but there are finished projects that I didn't take into account. It seems silly to count fabric that I used 25 years ago. I need to get busy making backings for the tops I finished recently, that will help the spreadsheet look more respectable. And I think I need to cull some older fabrics from the stash, my tastes are changing and there are pieces that I don't think I'll ever use. 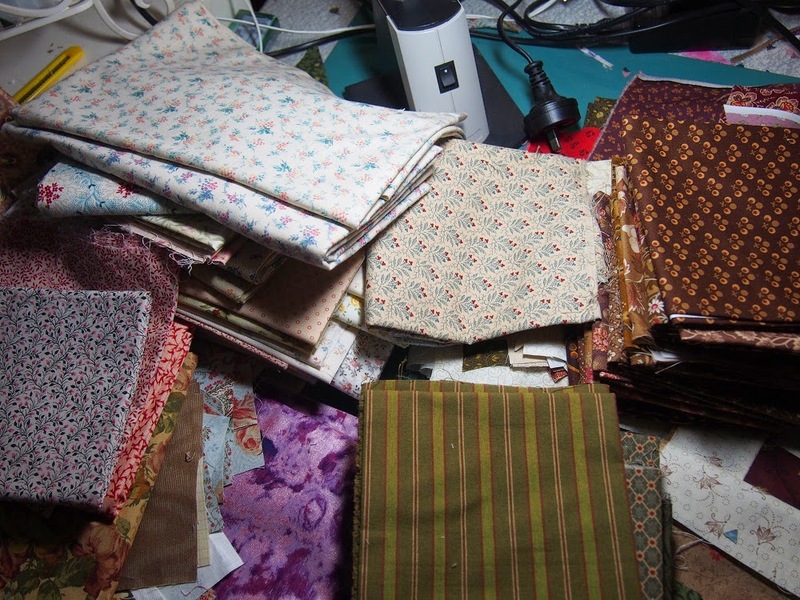 If I'm going to build a batik stash, I'd better make room for it now, or I'll be stacking it on the floor. Alas, I've finished all the easy UFOs, the ones that are left need difficult decisions about borders, or are only a single block and a pile of cut out pieces. From now on it's going to be a lot of work to get things finished. I did the only sensible thing and started something new. 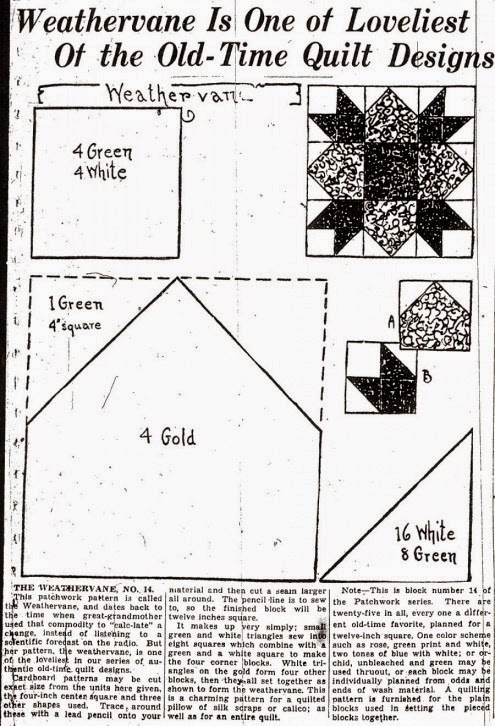 I've been threatening to start a batik quilt for ages, but couldn't choose a pattern. 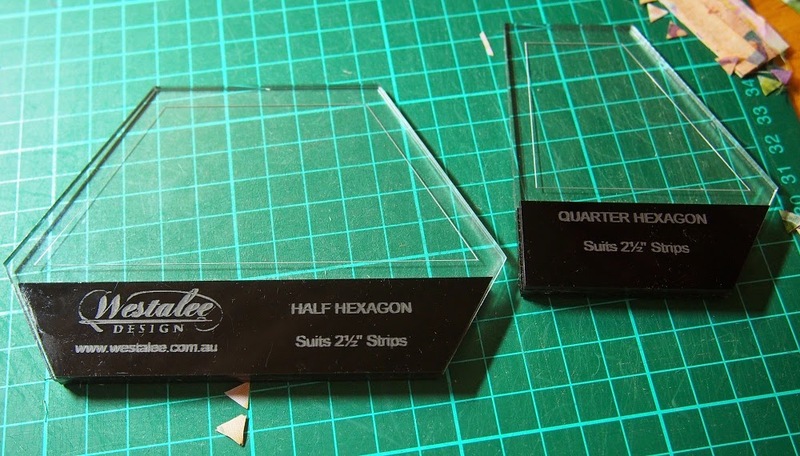 The last time we visited a patchwork shop I picked up this set of Westalee rulers, specially designed for jellyrolls. (Here's a link, you will have to scroll down to find the half hexagon rulers.) I figured there wouldn't be any tough decisions to make with this shape, I love hexagons and half hexagons, and the cutting would be a breeze. Luckily I was right, and it took only a few sessions to cut up a whole jellyroll of batiks; it's taking a little longer to get them all arranged on the wall. There aren't as many light value shapes as I would like; I NEED more batiks, I just don't have a big enough stash. I found some hand-dyes that will fit in, and I'm sure I can rustle up a few more fabrics from my tiny modern stash, but I really think I need to go back to Charlene's at Jamestown. 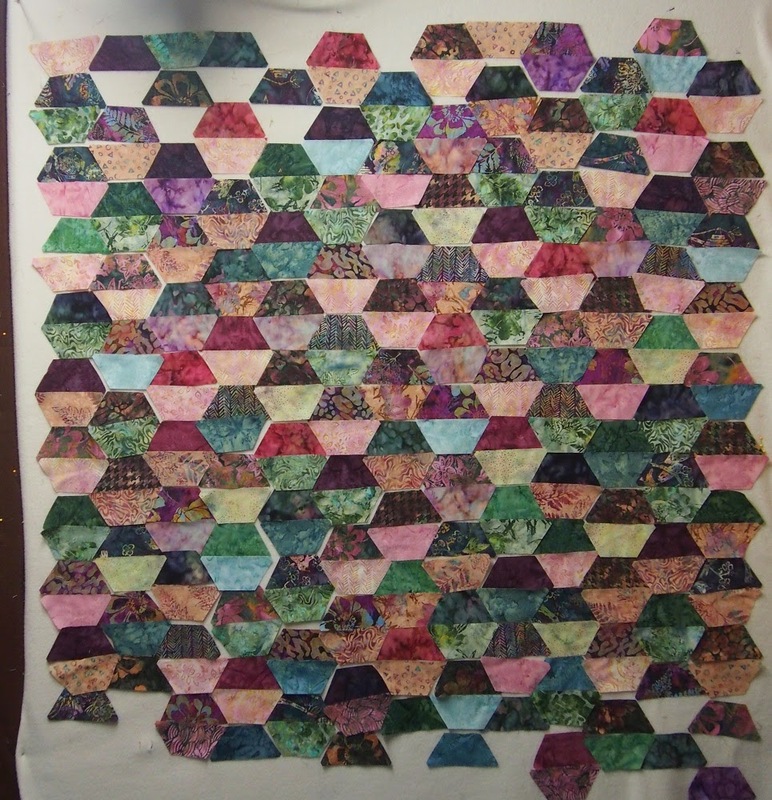 I'm going to sew the shapes into rows, and then wait till I've been shopping before I sew the whole thing together. I counted my red nine-patches, and I have 41, roughly one quarter of what I need. These are a wonderful leader-ender, easy to cut and put together, and boring enough that I'm not tempted to sew them on their own. 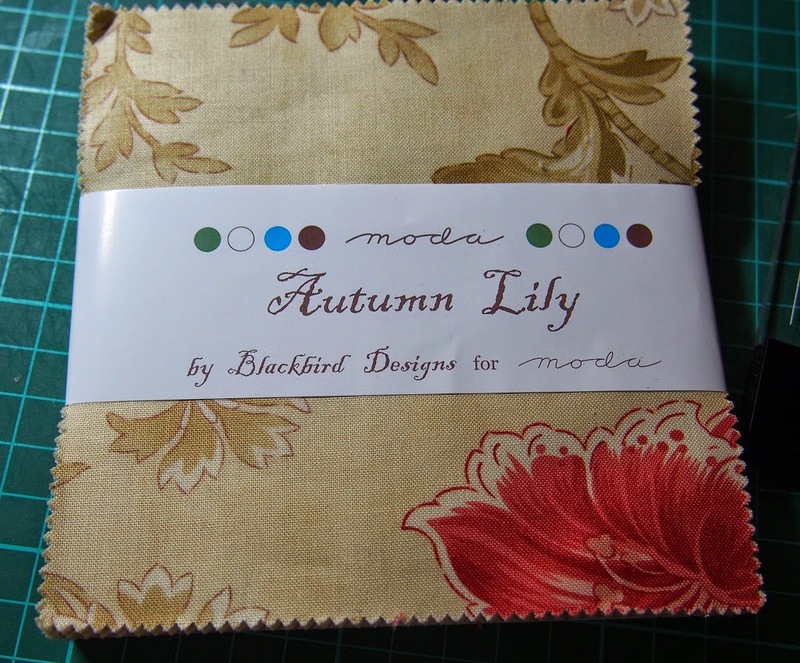 On my travels I also picked up this charm pack of Blackbird's Autumn Lily range. What a sweet little pack, I intend to play with this and decide what fabrics I'd like actual yardage of. I'm sick of trying to track down fabrics 3 or 4 years after their release date, so it's a wise thing to buy a few lengths of good border or background designs when they are actually available. Next post I might share my stats on how much I've used and purchased this year; not a great effort for stashbusting, as I've been concentrating on the UFOs, but I have a huge stack of tops that need backings and that will help the numbers. Thanks for all the suggestions for naming my block; I've decided to call it Homestead Star. The house shapes are like the simple settler cottages dotted over our landscapes, many with a windmill close by, and the weathervane reference makes me think of our Southern Cross windmills. 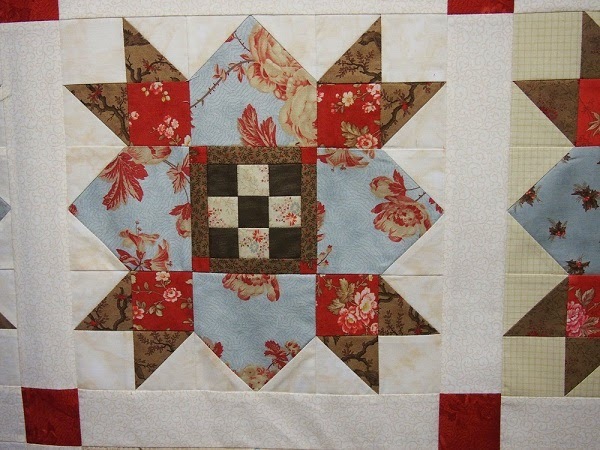 And that reminds me of the Southern Cross in our night skies; so there you go, block and quilt named. It's a long weekend here, and I spent yesterday working in the garden and stayed up sewing till 2am. 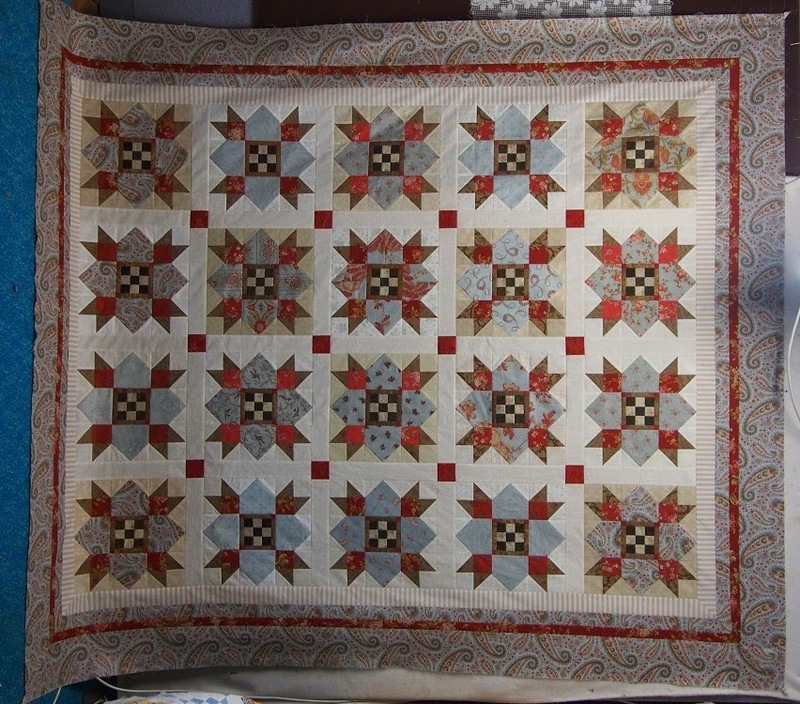 I really wanted the borders on the Basket quilt and the Homestead Star finished, so I just kept going until they were done. The Homestead Star borders took ages, there are 16 strips to sew into sets of four, and then I had to attach them and mitre the corners. I like the end result, and that paisley was just right for the borders, I'm glad I decided to use it. The little triangles around the basket quilt were tedious and I didn't enjoy making them fit, but I think they look pretty marvelous. It was worth the fuss and bother, but I'm very, very glad to see it finished. 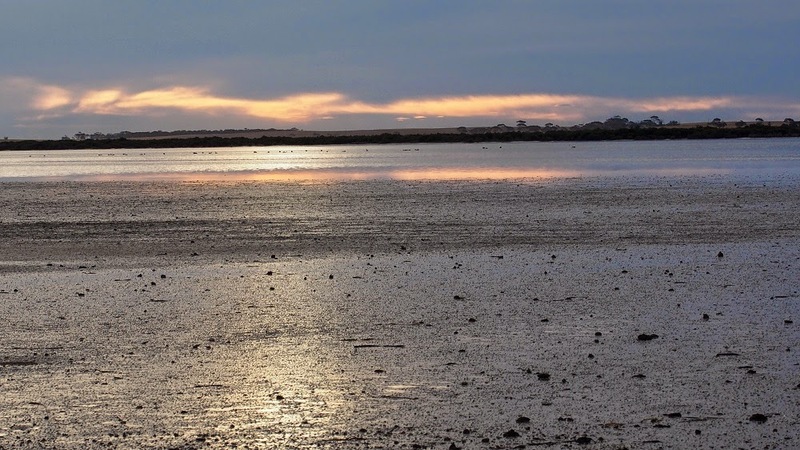 Our trip to Broughton on Thursday was wonderful; all the dogs enjoyed themselves on the beach, it was very exciting as the sun went down and the tide came in. It's lovely to see them all interacting with each other and getting on so well. Dogs need a lot of doggy friends for a well-balanced life. 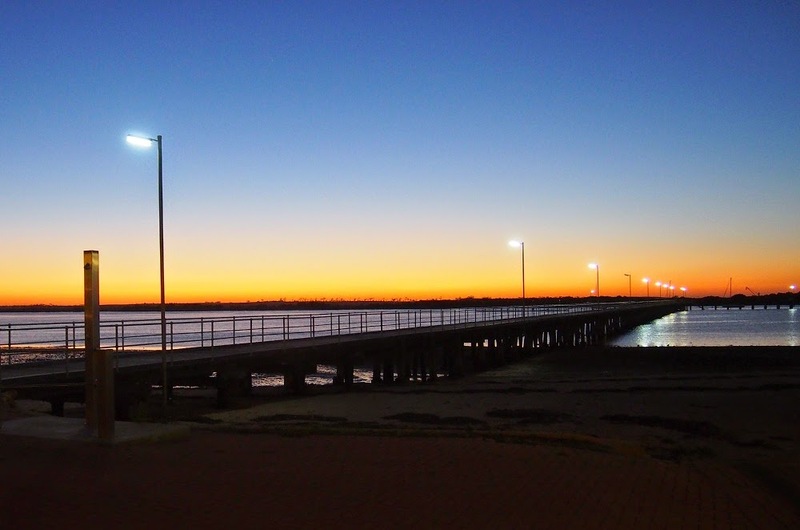 The sunset was spectacular, as was an enormous pile of fish and chips that the 8 of us demolished happily. The only flaw in the outing was how cold it was, the day had been so hot that we forgot to take jackets with us. We won't make that mistake again. but mine has the nine-patch in the centre, surrounded by a half inch border. I'm trying to think of something clever and appropriate to call it, but I'm not feeling particularly clever right now. It might have to be the red/blue/brown quilt for a while yet. The paisley fabric won, I decided it was prefectly acceptable and that I really can't afford the time to go to the patchwork shop. I tracked down some aqua fabric from the Park Avenue range, even had it in the shopping cart and was about to press the button, when I came to my senses. 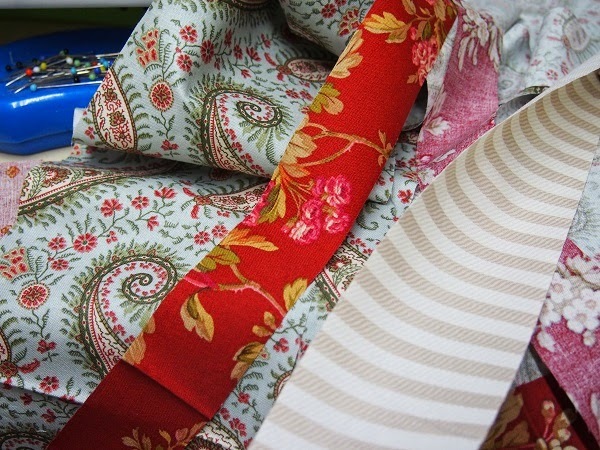 It wasn't the fabric I loved, I would have to wait weeks for it, and I could be sewing on borders within minutes if I just went with the paisley. So I did. I don't think I like being sensible, it's no fun, but it's a lot more convenient at times. There's so much to do in the garden, and it's the school holidays; that means we try and spend more time with schoolteacher John and his family. The travelling in and out adds at least an hour to every visit, it's a nice drive but not when we're budgeting our time, trying to get everything done before the hot weather. Spring is a busy time for us gardeners. Today we're going in for a visit, then driving to Port Broughton with some other people for a walk on the beach ( 5 dogs) and then fish and chips all round. The lady at the cafe has been giving us buttered bread for the dogs lately, that's sweet and they appreciate it. They're as ravenous as the seagulls after a romp on the beach. So are we.